I think this is one of the most significant entries I will have written. I have struggled for hours to begin to type and piece together what has taken months, if not years to learn, and condense it into a clear and concise article. It is a wonder that Isaiah is able to put so much information into so few words and without a solid background and understanding of the Lord’s work in His vineyard as a whole, which spans dispensations and all the players involved, it is nearly impossible without the spirit of revelation to begin to comprehend his prophecies. 30 And in that day they shall roar against them like the roaring of the sea: and if one look unto the land, behold darkness and sorrow, and the light is darkened in the heavens thereof. Here, Isaiah is prophecying in five verses many significant events that will occur in a span of over a century. In verse twenty-six, the Lord will establish Zion, which will be the ensign unto all nations by means of the restoration of His church and the fullness of the gospel. In the next two verses we read about the rate at which the restored gospel will be carried as the gathering of lost tribes of Israel commences. There is a lot of imagery here that emphasizes a great sense of urgency. During Isaiah’s time, people traveled by horse, chariot, camel, donkey, on foot, etc. Today, we have cars, airplanes, cell phones, internet, etc. In other words, our hoofs are like flint. Blinding light speed! Wheels like whirlwind. I’m not sure how fast they traveled back then on chariots, but today, cars and trucks speed along highways and airplanes achieve a substantial speed before they take off into the air. We are living in a time of advanced technology. 12 And verily, verily, I say unto you, that when they shall be fulfilled then is the fulfilling of the covenant which the Father hath made unto his people, O house of Israel. 13 And then shall the remnants, which shall be scattered abroad upon the face of the earth, be gathered in from the east and from the west, and from the south and from the north; and they shall be brought to the knowledge of the Lord their God, who hath redeemed them. 14 And the Father hath commanded me that I should give unto you this land, for your inheritance. 16 Then shall ye, who are a remnant of the house of Jacob, go forth among them; and ye shall be in the midst of them who shall be many; and ye shall be among them as a lion among the beasts of the forest, and as a young lion among the flocks of sheep, who, if he goeth through both treadeth down and teareth in pieces, and none can deliver. Just as the Lamanites became a scourge to the Nephites to “stir them up in ways of remembrance,” so will the Lamanites become a scourge to the Gentiles in the last days. Notice in verse sixteen that they shall be as lions not only among the flocks of sheep, but also the beasts of the forest. None shall be immune. Those who fight against Zion because of their wickedness and also those in Zion who are asleep. As Nephi put it, they will not “search knowledge” and will remain in ignorance, thinking all is well in Zion. These are the foolish virgins of whom Christ spoke during His mortal ministry. 23 The Lord’s scourge shall pass over by night and by day, and the report thereof shall vex all people; yea, it shall not be stayed until the Lord come. Has this already begun? Perhaps it has and we have been given a sign. 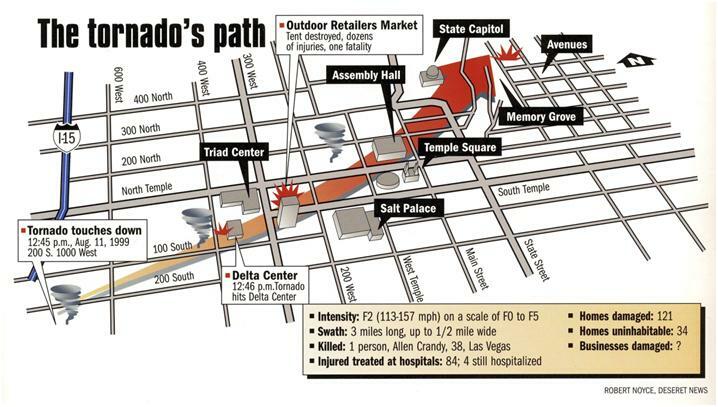 In 1999, the heart of Salt Lake City, Utah was unprecedentedly hit with a tornado, which swept through a very concentrated area, destroying buildings and causing extensive damage, of which Temple Square and the Assembly Hall was not immune. The University of Utah’s meteorology department caught dramatic video of the tornado that hit downtown Salt Lake City on August 11, 1999 and can be viewed here and from a news channel here, both on Youtube. they awake up in darkness without any oil in their lamps. But, as a general thing, the Saints will understand the signs of the times, if they do lie down and get to sleep. Others have their eyes closed upon the prophecies of the ancient Prophets; and not only that, but they are void of the spirit of prophecy themselves.